Photo via Questura di Roma’s Facebook. One of the most terrifying things about love is that it’s supposed to last forever. “I want someone that I can grow old with,” is an allegedly romantic thing that people write on dating sites to show that they are not afraid of commitment. (“I want someone to take care of/take care of me” is its creepier, tangential sentiment.) Weddings are mired in the same: find a “life partner” and pledge eternal love, or at least ‘til death do you part. Subsequent anniversaries are indicators that a couple has “passed the test of time” and/or that their love has “endured through hardship.” Love is all you need, after all. 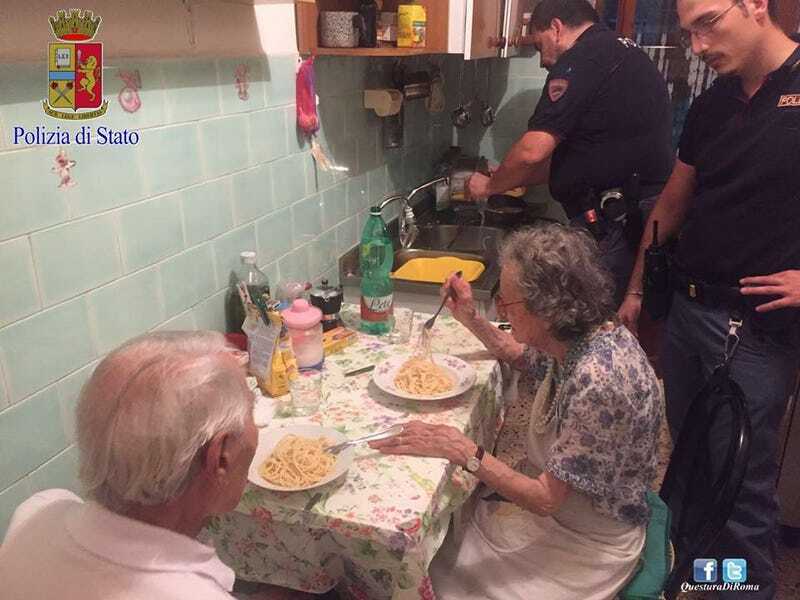 Meet Jole (84) and her husband Michele (94), a couple living in Rome who were recently visited by the Italian police after their neighbors reported hearing shouting and crying from their apartment. According to the Evening Standard, the police discovered that there had been no crime (or accident) when they arrived. Rather, the couple—who have been married for 70 years—had been watching the news and were so “overcome with emotion” that they began to sob loudly. It was noted that they had not had visitors for some time, and were very lonely. The police force said on its Facebook page: “Especially when the city empties and the neighbors are away on holiday, sometimes loneliness dissolves into tears. It can happen, as this time, that someone screams so loud from despair that eventually, someone calls the State Police. There is no one to save, and we are all actively dying. Have you heard the Atlas Sound song “Shelia?” No? It’s a song that I think Jole and Michele might relate to. Now is a good time to listen to it.